New onto the market and an opportunity not to be missed, is this pretty 2 bed stone cottage located in peaceful countryside but just a short distance to the popular medieval town of Pontivy. The local village with boulangerie, small local shop and school, is also just 2kms away, so giving you the best of all worlds being in the countryside yet close to amenities. Being offered for sale fully furnished, all you need to do it turn up with your suitcase. 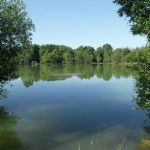 Rarely seen onto the market, so an opportunity not to be missed, is this stunning 2 acre lake which sits on just approx. 5 acres of land with a stock lake around it. It is located at the end of a track in peaceful, tranquil countryside and just a short drive to the popular towns of Loudeac and Pontivy. With the impression of being in the countryside on account of its location, this detached 4 bed property is actually on the edge of a village with some amenities and is just a short drive to the popular historical town of Pontivy. The property sits on 708m2 of land and offers you the opportunity of just moving straight in. Feature marble floors and staircase and a slight ‘kink’ to the house, make this property rather unique. This delightful quirky house is located 1k from the village and 6kms to Pontivy. The gardens are on various tiers, containing fabulous rockeries with pathways culminating onto a lovely lawn area. The property comprises on the ground floor of kitchen, dining room, snug/second lounge, two bedrooms and shower room and the first floor comprises of a lounge one side and a bedroom with ensuite on the other side. The swimming pool is fully fenced looking over the house and its beautiful gardens.